It is pretty accurate to say that getting a $500 soundbar is going to get you the best balance of price and performance. This is where you really start seeing good speakers, quality audio and sound stages which are not often associated with soundbars. Because of that, some of the best soundbars available can be found in this segment of the market. The next big leap happens in the $1000 category We have prepared some of the best models you can get for $500. With that said, each model comes with its own set of qualities. Let’s dig right in. Nakamichi’s Shockwafe Pro packs a lot of heat in a very low profile system. One of the first things you notice are its ten drivers which are positioned to for best effect. On top of that, you also have a wireless subwoofer which saturates the lower end of the frequency range with hard hitting bass. Overall, an amazing system. If we had to find a complaint with the Shockwafe Pro package (which, let me tell you, has proven quite difficult to come by) it would be that the satellite speakers seem to be tuned a little too loud relative to the subwoofer and soundbar itself. This can create an odd, directional effect depending on how you place the speakers within a room, but if you know about it in advance can easily be remedied through clever placement. An elegant, unassuming design that offers great and surprising versatility. Tons of streaming options, all of them useful and effective. Audio quality that really delivers and is customizable. May require some tinkering to suit your room set-up. We really like what Sony has managed to pull off with the HT-CT800. Starting from a design that will work in just about any conceivable use case, they have crammed in a whole package of meaningful, useful features and options which are topped off by a fantastic audio performance that will transform your listening experience. In order to get the most out of what the HT-CT800 has to offer, it is well worth the time and energy to fully understand the variety of customization options on offer as they will make a huge difference to your overall listening experience. With the default settings, you may be initially underwhelmed depending on your listening location, but some tinkering should fix this issue. The audio quality is utterly exceptional and sets it apart from the crowd. The design is simple, if odd, and build quality is high. May not fit your space due to its unusual form factor. Many might find this guitaNot much in the way of extras, and lacks HDMI throughput.r a bit limited sound wise. As audiophiles, we can’t get enough of the incredible sound that Q Acoustics have managed to develop with the QM4. If you’re in the market for a product with loads of extras that looks flashy and has a low profile, this may not be the right choice for you. But if you’re all about the performance, you can’t go wrong. 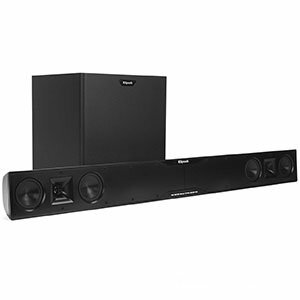 Klipsch HD Theater SB3 is a soundbar and subwoofer combo that brings very heavy core components. We’re talking large, high-quality drivers in the soundbar itself, along with a massive 10″ cone in the subwoofer. On top of that, Klipsch has included a balanced set of features which harness all this power pretty well. Depending on where you will be setting the SB3 up, you may or may not find its size to be something of an issue. 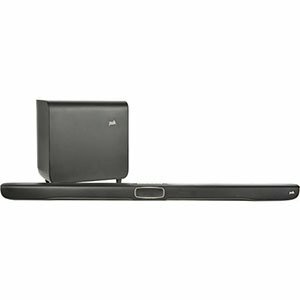 It is certainly one of the bulkier soundbars we have come across, and both the bar itself and the included subwoofer will require careful placement in order to balance convenience, space, and the listening experience itself. Keep this in mind, and you will be well placed to deal with the issue. 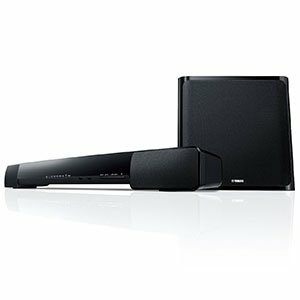 Yamaha’s YAS-203 is a well balanced, somewhat simplistic soundbar system. It packs just enough power but also comes with all the necessary features that will make your TV watching experience more enjoyable. Its wireless nature allows for easier setup, and the sound is pretty much on point. Overall, it’s a great choice for the money. An attractive, simple, and versatile design with some nice touches. An assertive, powerful performance with more presence than you’d expect. Good amounts of customization are available. Highs aren’t as nuanced as we would like. The SH7B is a great choice for anyone looking to upgrade their TV- and movie-watching experience. It will absolutely take it to the next level with a confident, powerful, and punchy performance that brings out the best in soundtrack, effects, and dialogue. Whilst music won’t sound the best, this isn’t a deal breaker by any means. The listening experience is at its best when you are watching visual media or playing games, and this comes down to the fact that the SH7B is weakest when it comes to the high ends of the audio spectrum. It is not, by any means, a major issue, and the sound is more than adequate, but if this is likely to be a problem for the type of playback you have in mind, then you may wish to look elsewhere. Clean design that fits in anywhere. Wireless subwoofer that packs a large cone. VoiceAdjust feature makes all the difference in the world for movie watching. Not enough range when it comes to listening to music. 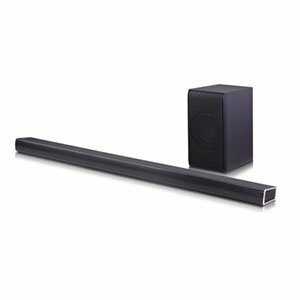 Polk Audio Omni SB1 Plus is a pretty compact soundbar that features a wireless subwoofer, great set of features and performance optimized for an impressive movie watching experience. Their VoiceAdjust technology allows you to really dial in those voices, making them crystal clear. At the end of the day, it has its fair share of limitations and benefits. The bass performance of the SB1 Plus is quite impressive for a soundbar and subwoofer combination which, traditionally, do not deliver much in the way of presence in this regard. That said, there is a notable lack of dynamic range which is most obvious when you’re listening to music or during musical moments in films. It isn’t the end of the world, but something to consider. What Can You Expect From A $500 Soundbar? 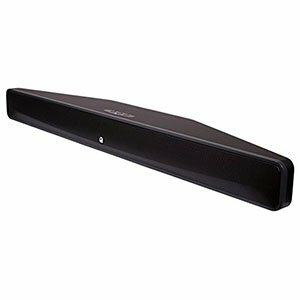 There are many reasons why investing this type of money into a soundbar system is scary for a lot of people. 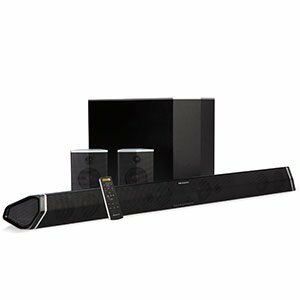 Some of the most frequent questions have to do with how far can you really push a soundbar and whether or not you’d be better off getting a different type of system. With that said, soundbars in $500 range are anything but overpriced boxes with tiny speakers. On the contrary, most of the models in this segment come with more than decent speakers. If you take the Klipsch unit from our list and break it down, you will find 3.5″ drivers paired with a 10″ subwoofer cone. Not only that, but it comes with four drivers, two tweeters and that massive subwoofer. You will be hard pressed to find conventional speakers that pack that much heat. Performance caps are definitely not an issue here. This segment of the market is also where standalone subwoofers are the norm and most of them are wireless. That means two things. For one, you know that you will get a decent low end response no matter what is in the soundbar itself. On top of that, you can position the soundbar wherever you need to, without worrying about cables. Next comes the design of the system. Unlike it is the case in say, $200 segment of soundbar speakers, the design of the soundbar itself is much more complex. We are talking careful positioning of transducers, cones and sound ports. All of this is necessary if you want to get a flexible yet saturated sound stage. What really puts $500 soundbars on a whole different level are the features. You are much more likely to find advanced audio control in this segment, with complex EQ modes and tone shaping options. Last but not the least, there are satellite speakers. A good portion of soundbars within this price range come with two satellites at the very least. In other words, you have access to a complete surround sound system that will give you high levels of immersion. That is not something you’ll see in cheaper models. These are just some of the reasons why investing in a $500 soundbar is worth doing. Good, quality made soundbars have the ability to give you a far better audio experience than your TV, or entry level soundbar ever could. Not only that, but you are already walking into audiophile class sound territory. The models listed above are some of the best soundbars in this segment of the market. Each one features its own unique design that brings different qualities to the table. 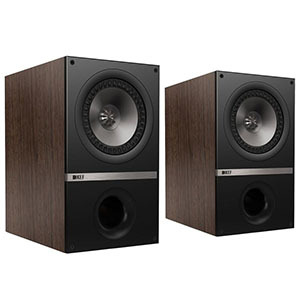 However, all of them are capable of delivering a very refined sound stage right in the comfort of your home. This means you’ll enjoy movies the way they are meant to be experienced.